Operation Rescue Headquarters, Wichita, Kansas — Operation Rescue is wrapping up an eventful and productive year, culminating with the release of our annual survey of abortion clinics that revealed the good news that the national trend of closing abortion clinics strongly continues. Here are some of the important developments from 2015 that put Operation Rescue in the international headlines and the Abortion Cartel on the ropes! 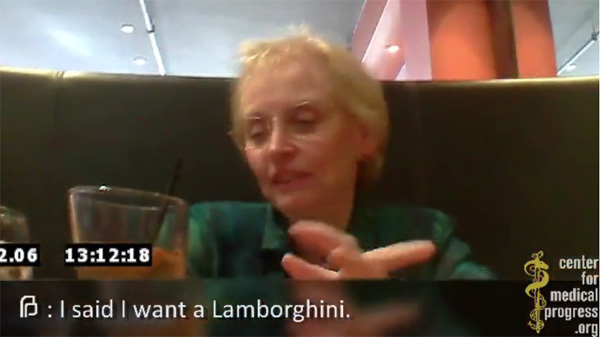 The Center for Medical Progress changed the game over the summer by releasing several undercover video summaries that depicted Planned Parenthood personnel at the highest levels negotiating for the sale of aborted baby body parts with undercover CMP actors posing as representatives of a biologics company. Troy Newman, President of Operation Rescue, served on the Board of the CMP during the nearly three-year investigation. Because of his advisory role in the project, once the first videos were released, Newman, along with CMP head David Daleiden, was sued in Federal Court by the National Abortion Federation. The NAF is attempting to keep videos related to their role in the baby body parts scandal from being made public. That lawsuit is ongoing and continues to threaten free speech and free press rights in America. Despite the attacks (both legal and in the pro-abortion media) that Newman and Operation Rescue have endured from a panicked Abortion Cartel as backlash to this project, and Planned Parenthood’s aggressive public relations campaign to cast doubt on the veracity of the videos, Planned Parenthood has been subject to numerous investigations, including ongoing Congressional committee hearings. The videos have led to the first-ever successful vote in both chambers of Congress to defund Planned Parenthood, and raised abortion as a major topic in the 2016 Presidential election. It also gave Newman numerous media opportunities, including appearing in a Fox News special on the Planned Parenthood scandal. In Missouri, a legislative investigation of Planned Parenthood due to scandal has resulted in Planned Parenthood’s Columbia abortion clinic to halt abortion services, and it is sure that impact of Daleiden’s video exposés will continue to reverberate throughout 2016 and beyond. Watch the videos on YouTube.com. Just before Christmas, Operation Rescue released the results of its annual survey of every abortion facility in the nation – and the news was good! In all, Operation Rescue documented that 53 abortion facilities either closed, halted abortion services. We received documentation of one more closure after our report was published. That brings the grand total of abortion clinics out of the killing business in 2015 to 54! A CDC report verified that abortion numbers were down to historically low numbers in 2010 about the time when the abortion clinic closures were starting to increase. This provides additional support for Operation Rescue’s long-held assertion that closing abortion clinics decreases abortions and saves lives. Read Operation Rescue’s full clinic survey report. 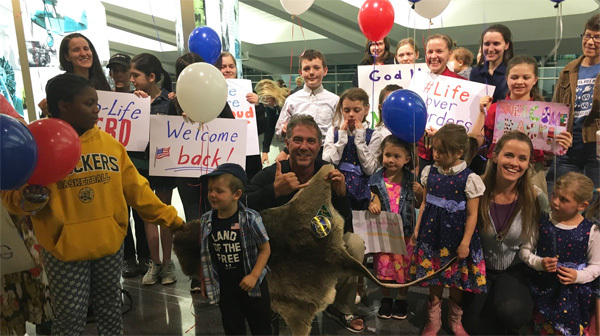 Excited to be invited on a national speaking tour of Australia by Right to Life of Australia, Newman and his wife, Melissa, boarded the first leg of a long flight to Melbourne in late September. While in transit, Newman received a message that there was a problem with his visa but was assured that the misunderstanding would be cleared up before his plane arrived in the Land Down Under. A pro-abortion Member of Parliament had submitted a last-minute objection to Newman’s visa based on an erroneous report that Newman advocated violence against abortion providers. The fact is that Newman has never advocated violence and instead encourages activists to use the legal system to bring an end to abortion through peaceful means. Upon landing in Melbourne, Newman was taken into custody where he stayed until finally being deported back to America three days later. Newman had appealed the decision to withdraw his visa, but unfortunately, the high cost of litigation in Australia forced him to withdraw his appeal. Nevertheless, the international media firestorm that erupted from Newman’s detention launched a huge public dialogue about abortion in Australia, Great Britain, and beyond — perhaps more than his speaking tour may have if he had not been detained and deported. The pro-life community in Australia was extremely supportive of Troy and Mellissa, especially the good people of Australia Right to Life, who will forever remain dear to them. Read our archive of reports for the full story. 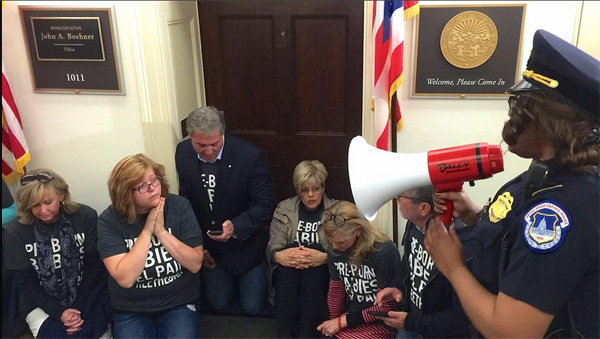 Tired of endless delays and broken promises regarding a vote on the Pain Capable Unborn Child Protection Act, eight pro-life leaders, including Troy Newman, were arrested in March while praying outside the office of Speaker John Boehner. The effort resulted in clearing the logjam. The Pain Capable Unborn Child Protection Act, was finally passed by the House a few weeks later. While the Act, which would ban abortions after 20 weeks in all 50 states, stalled out in the Senate, it is likely we will eventually see this law enacted perhaps in 2017 — providing a pro-life Republican wins the Presidential election next fall. While progress seems slow, pro-life efforts have finally created a climate this year in which future progress can finally be made. When Texas passed the abortion safety law known as HB2 in 2013, many people did not realize that Operation Rescue had been working hard to expose and report abortion abuses in that state that first showed legislators the need for more abortion clinic accountability. Operation Rescue discovered widespread abortion abuses in Texas during a 2011 investigation that resulted in heavy fines against two Whole Women’s Health abortion facilities for the illegal dumping of recognizable aborted baby remains in a public dumpster. In addition, two Whole Women’s Health abortionists, Alan H. Molson and Robert E. Hanson, were disciplined and fined thousands of dollars for violations discovered during that same investigation. But what prompted a sense of urgency to the special legislative sessions that ultimately resulted in law was Operation Rescue’s revelation that several former abortion clinic workers provided photographic evidence to back their allegations that Houston abortionist Douglas Karpen was twisting the necks of babies born alive during illegal late-term abortions in gruesome acts similar to those that convicted Pennsylvania abortionist Kermit Gosnell of murder. The benefits of HB2 have been incredible. So far, HB2 has shut down about half of the 43 abortion clinics that were operating in Texas, and reduced abortions in that state by an impressive 13% in the ensuing 12 months. Whole Women’s Health challenged the constitutionality of HB2 and now the U.S. Supreme Court announced this year that it will hear the case in March. If successful, this case will bolster new laws that we expect will result in more abortion clinic closures and could cast a fatal blow to the Abortion Cartel in America! Read Operation Rescue’s press statement on Whole Women’s Health v. Cole. With the help of pro-life activists across the nation, Operation Rescue documented a record number of medical emergencies at abortion clinics that resulted in the emergency transport by ambulance of patients to local hospitals. Pro-life sidewalk counselors broke out their Go-Pros and smart phones to record 52 medical emergencies at abortion clinics from coast to coast. 911 records show abortion injuries such as perforated uteri, hemorrhage, and even an incomplete abortion that resulted in a full hysterectomy and lengthy hospitalization for one woman. Documenting these incidents helps us provide data to the public and to legislators that debunks the faulty pro-abortion mantra of “safe and legal.” This documentation of abortion dangers is also expected to play a role in the upcoming U.S. Supreme Court case challenging a Texas abortion safety law that is set for oral arguments on March 2, 2016. Read more about abortion-related medical emergencies documented by Operation Rescue. 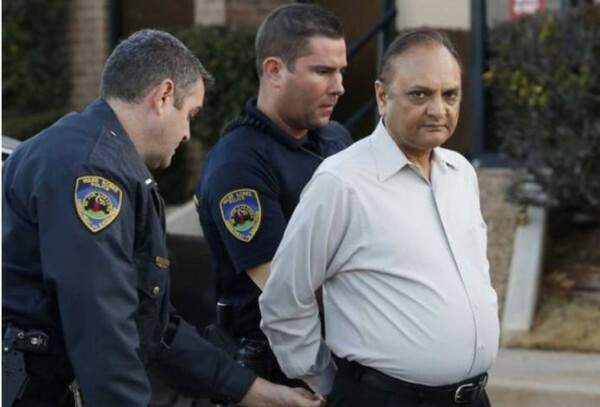 In the way of unfinished business, abortionist Naresh Patel pled guilty on October 23, 2015, in an Oklahoma City court to charges of defrauding women in a scam in which he sold abortion pills to women who were not pregnant. He was heavily fined and ordered to serve a short stint in jail. Operation Rescue had investigated Patel and lodged a complaint against him with the Oklahoma Attorney General’s office in 2014. As a result of the ensuing investigation, Patel was arrested and charged with three counts of fraud. Today, in a case that would never have happened if not for Operation Rescue, Patel is permanently banned from the practice medicine and his Oklahoma abortion clinic remains permanently closed. When Fr. Terry Gensemer, director of the CEC for Life, suspected that the Selma office of Samuel Lett, known as the Central Alabama Women’s Clinic, was illegally conducting abortions, Operation Rescue’s staff immediately went to work and obtained the evidence that Lett’s office was scheduling more abortions per month that legally allowed for unlicensed abortion facilities. •	Life Legal Defense Foundation stepped in to assist with letters to the Alabama Department of Health calling for the immediate closure of Selma’s illegal abortion business. •	Catherine Davis, of the National Black Pro-Life Coalition led a press conference then planned a national event in Selma to draw attention to the dangerous, illegal abortion clinic that targeted primarily poor urban women of color for abortions. •	Created Equal blanked Lett’s Selma neighborhood with postcards exposing his illegal abortion business. While waiting on the Health Department to take action, Lett underwent a number of professional setbacks, including the loss of hospital privileges. As a result of a unified pro-life team effort and prayers, Operation Rescue confirmed that Lett has changed the name of his office and halted illegal abortions in Selma, and that community is now abortion free! In October, shocking news broke that three abortionists were caught by authorities in three states operating dangerous illegal abortion schemes. While law enforcement did not release the identity of those arrested, Operation Rescue soon discovered that it was Florida’s notorious abortionist James Scott Pendergraft and his female associate who were charged with several drug violations. Operation Rescue formally notified state Attorney General’s offices in South Carolina and Florida of Pendergraft’s arrest and long history of documented abortion abuses. Pendergraft’s criminal case is still pending. In another notable case, the Michigan Attorney General’s office has filed a complaint against abortionist Michael Roth, for conducting illegal abortions out of his car trunk after he had been ordered not to do abortions outside an authorized clinic or hospital. Roth had been involved in an accident in early October that left a special needs child critically injured. When authorities searched his vehicle, they discovered 14 plastic tubs containing aborted baby remains. Also found in his vehicle were medical implements and “large amounts” of Fentanyl, a drug favored by abortionists used to sedate women prior to their abortions. Two weeks later, Federal agents raided Roth’s home and office. They executed two search warrants, removing bags full of evidence from his home. The Attorney General’s office filed the civil case against him a short time later, which could result in the revocation of Roth’s medical license. Finally, a man with no medical background was arrested on September 30, 2015, in Las Vegas, Nevada, for conducting illegal abortions out of a trailer on his property. Rick VanThiel, told authorities that he learned how to do abortions and other procedures from watching Youtube videos. He advertised on seedy, adult web sites and charged what he called “unbeatable prices” of $200 per abortion. As for the coming New Year, Newman is optimistic.